The border crossing itself was pretty straightforward. I had to make a dash through the rain at one point carrying our 10kg back pack and Tomas on my shoulders. In Poipet, on the Cambodian side, we were told there would be a two hour wait for the bus to Siem Reap but they took pity on us being with children and we completed the journey on a bus full of contraband biscuits. That evening over a cold pint of Angkor beer we decided there must have been something fishy going on as we were the only ones from our bus that already had Cambodian visas. 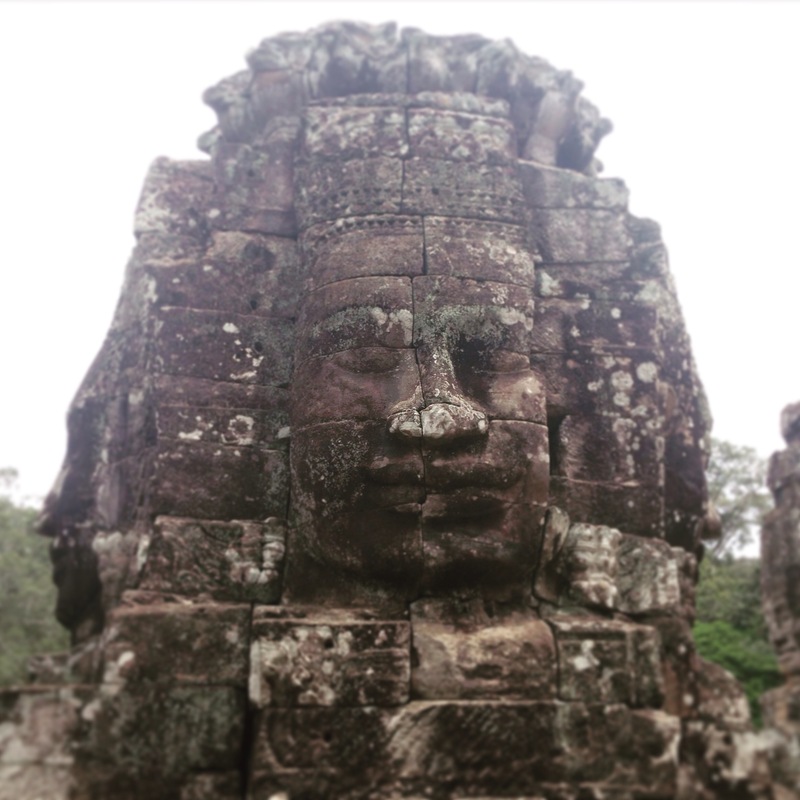 We gave ourselves a day of playing round the pool to recover from the journey and then headed out to get a big tick on our bucket list; Ancient Angkor. 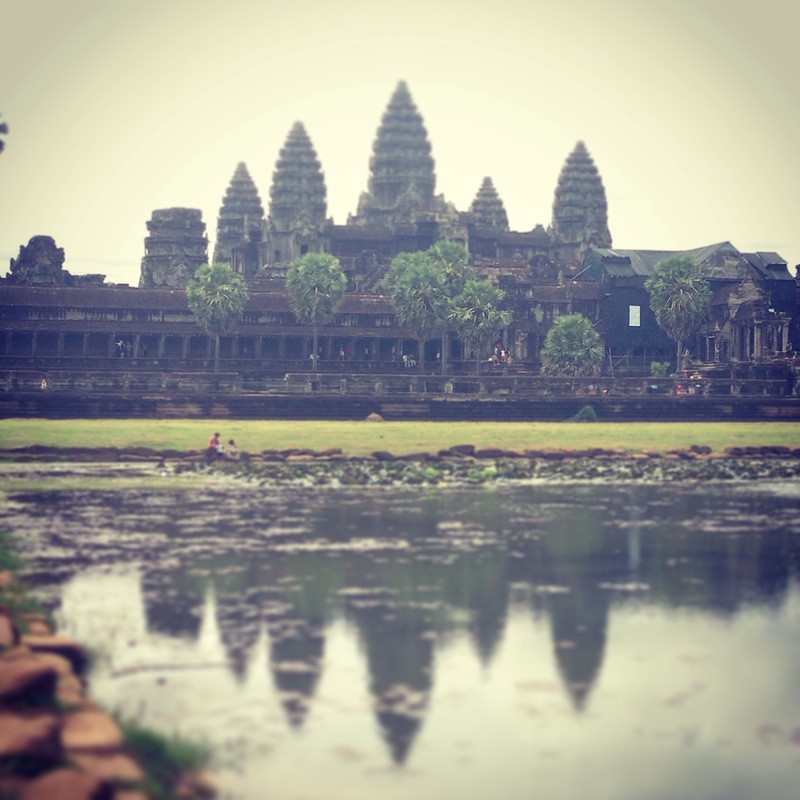 Knowing that the kids would run out of steam pretty quickly we decided to limit our visit to the top three sites; Angkor Wat, Bayon and Ta Prohm. We spent an enjoyable morning exploring the ruins; playing (can you guess?) hide and seek and pretending to be Lara Croft. Nick and I loved the majestic stone faces at Bayon but the highlight for the boys was the millipede they found at Ta Prohm. That evening, after I’d donated blood at the nearby children’s hospital, we treated the boys to a visit to Bugs Cafe. Some mealtimes can last forever persuading the kids to eat unfamiliar food. 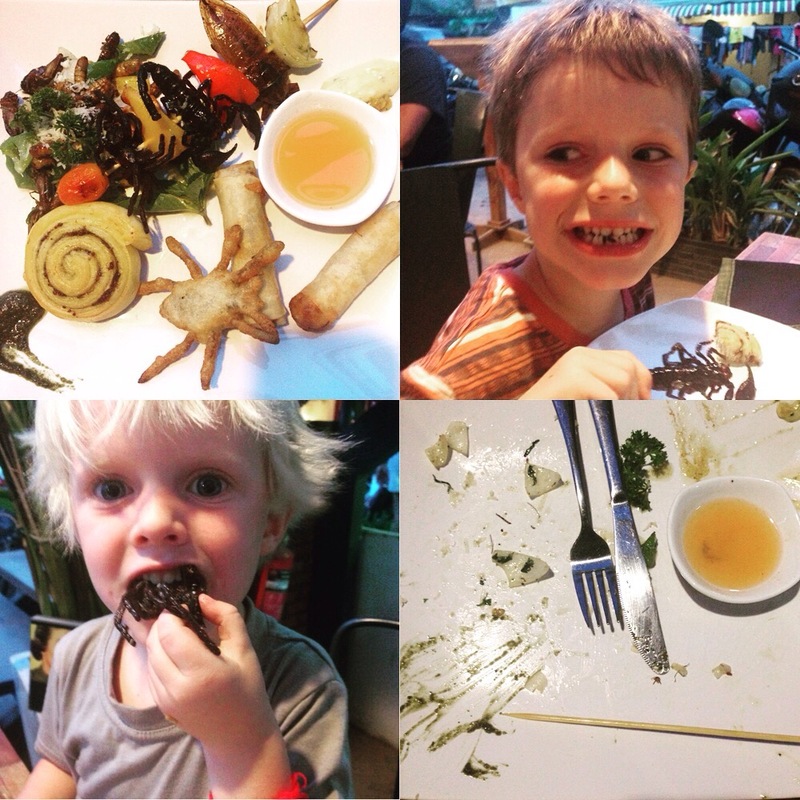 Not so with our discovery platter where they wolfed down, tarantula doughnut, ant spring rolls, scorpion skewer and the cricket salad. Nick and I barely got a look in. 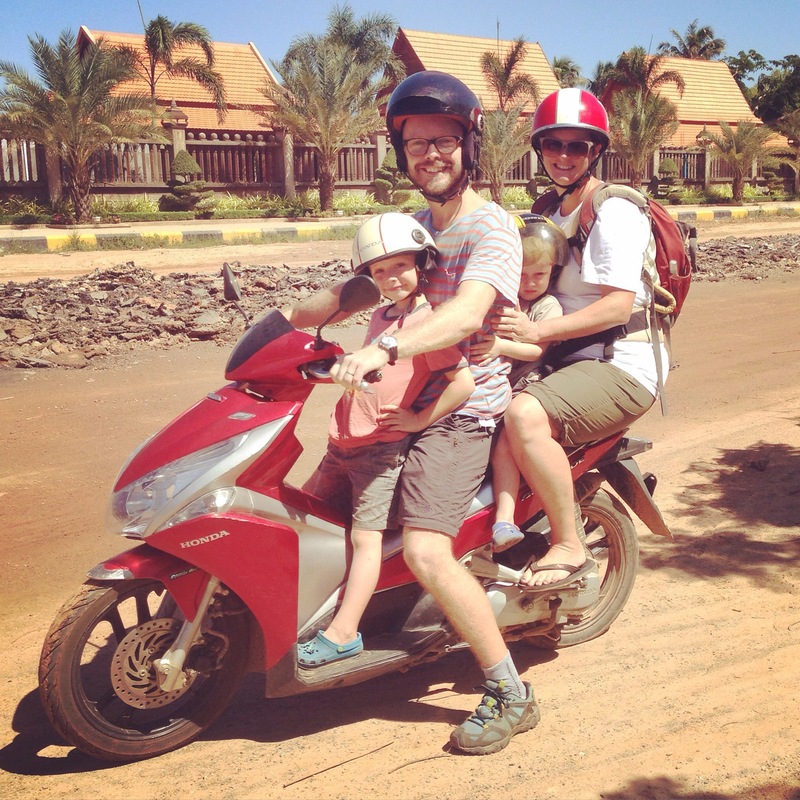 We enjoyed the ride out to the Cambodia Landmine Museum passing some of the lesser known Angkor sites along the way. T refused to go in, preferring to hang out with our tuktuk driver. G handled the visit very maturely; sitting quietly and listening to the audio guide. The museum was founded by Aki Ra, a child soldier under Khmer Rouge who went on to clear the land mines he’d helped install. The mock-up of a minefield shows the sheer number of ordnance that can be hidden in a small area and how hard they are to see. We learnt more about the ongoing issue of landmines and stories of those affected. Children are often maimed picking up a mine thinking it is scrap metal that they can sell. On the bus from Siem Reap to Phnom Pen I read First they Killed my Father. One woman’s account of the atrocities that saw a quarter of the population of Cambodia (over 2 million people) systematically killed. Loung Ung was just 5 years old when the Khmer Rouge took power. The narrative, written through child’s eyes, really brings home the horror of the time; forced labour, brutal killings and life as a child soldier. Travelling through the very countryside where the atrocities took place with my own 5 year old made her story incredibly vivid. The following day we visited the Killing Fields of Choeung Ek. This was one of the most moving experiences of my life. On first sight the area covers a peaceful wooded field. But as the audio guide leads you around you come to realise the horror that occurred there. Thousands of bodies of men, women and children were recovered from mass graves and there are still remains coming to the surface so that at times there are bones and cloth poking through the very path you walk on. The audio guide ends at the memorial stupa displaying thousands of skulls. I was disturbed to see people taking photos, it felt really inappropriate. Even more so when I later discovered the images on Instagram. To me using a hashtag to share photos from the Killing Fields is not only disrespectful but also trivialises the genocide. However as education is key in reconciliation perhaps I am wrong and it is simply a way of sharing history with a younger generation. Next we visited the Tuol Sleng Museum a former school used as a prison under Khmer Rouge. The museum is filled with haunting photographs of the prisoners taken on their arrival at the prison. Their eyes looking back at you give a human face to the numbers. It is a tough place to visit with photographs and instruments of torture on display. As with the Killing Fields we didn’t take the children. I was left feeling helpless, dispairing of the horror that humanity can inflict on itself. I was haunted by our days activities and didn’t sleep that night. Phnom Pen itself is a flagship for a new Cambodia. Boutique hotels, fancy eateries and impressive architecture portray an image of extravagance vastly at odds with the scenes of poverty. One can’t help but wonder if the government has its priorities wrong when faced with so many children begging and sleeping on the street. From the business of the capital we escaped to Kep. A sleepy seaside town, which was perfect for a few days RnR. We stayed in a bungalow and loved being serenaded by frogs, giant geckos and crickets whilst fireflies put on a show. The boys enjoyed the company of other children at the beach and we all enjoyed some fantastic seafood. We spent a couple of days exploring the surrounding countryside on a scooter. We visited nearby Kampot by accident when we couldn’t find the road to a cave we wanted to see. We got there the next day with the help of our 7 year old tour guides. They cycled alongside the scooter to show us the way and escorted us around the site of this pre-Angkorian temple and cave. We learnt that villagers hid there from Khmer Rouge reminding us again how the regime affected every corner of the country. This week we are volunteering at Khmer New Generation Organization (KNGO) School. 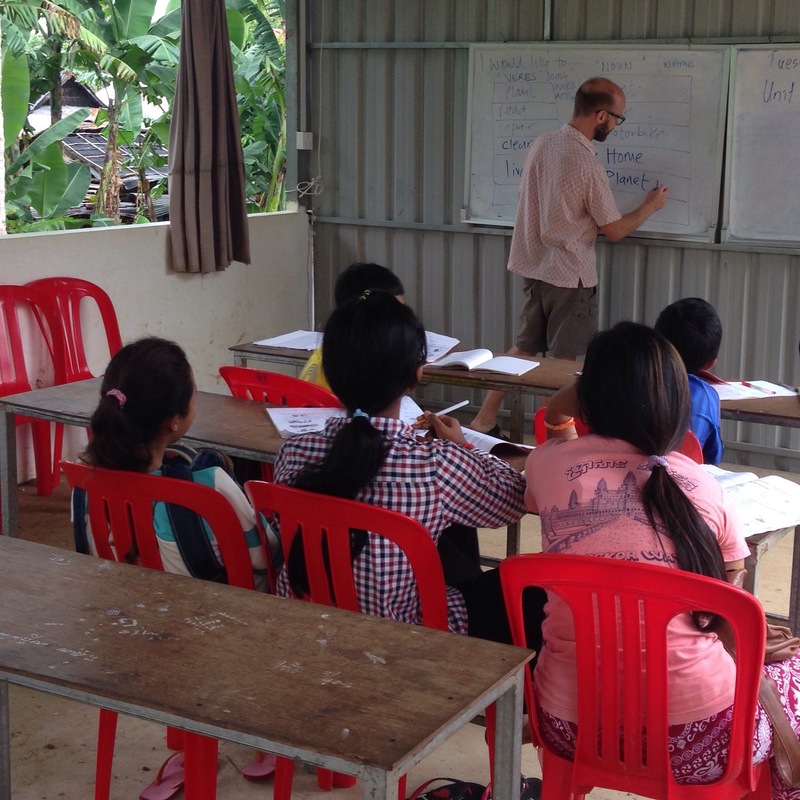 Located in the village of Bospo near Battambang, the school is a grass roots project that offers English lessons to the children in the surrounding area. The permanent teachers use a fixed curriculum and welcome native English speaking volunteers to assist with pronunciation. Nick is struggling with the Americanized [sic] English but we’re having lots of fun. The students are smart, engaged and eager to learn. The eldest class is working on ‘the future’ and it is so inspiring to hear them talk about their aspirations. Throughout our time in Cambodia I have found myself trying to guess people’s ages. Wondering whether they lived through the dark years of Pol Pot’s regime and how they managed to recover. Not for the first time I feel incredibly privileged to have been born where I was and not into the famine and unrest that Khmer people my age have lived through. We have passed through many countries ravaged by war but here the impact is much more evident. Despite the horror of the recent past and the resultant poverty Cambodia is wonderfully friendly and welcoming. It is a truly beautiful country to visit and if the KNGO kids are anything to go by the future is bright.